The North American Butterfly Association has several ways in which you can get involved in monitoring butterflies: getting involved in butterfly counts; posting sightings; and creating butterfly gardens. Students and classrooms can help track the monarch butterfly migration each fall and spring as the butterflies travel to and from Mexico. Report your own observations of migrating butterflies to the migration map. Monarch Butterfly: What Is CitizenScience? 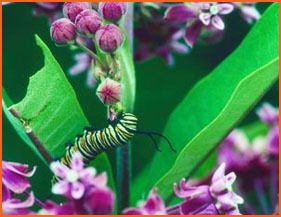 This web page from the USDA Forest Service has a list of citizen science projects for monarchs. Many aspects of monarch butterfly biology and conservation are being explored by scientists, teachers, students, and citizen scientist volunteers. Find more information on research publications by the Monarch Lab and references to publications by other researchers. To understand more about how research data are analyzed, check out our Basic Statistics section. The Monarch Larva Monitoring Project (MLMP) is a citizen science project involving volunteers from across the United States and Canada in monarch research. It was developed by researchers at the University of Minnesota to collect long-term data on larval monarch populations and milkweed habitat. The overarching goal of the project is to better understand how and why monarch populations vary in time and space, with a focus on monarch distribution and abundance during the breeding season in North America. As an MLMP volunteer, your contributions will aid in conserving monarchs and their threatened migratory phenomenon, and advance our understanding of butterfly ecology in general. There are a number of ways that you can get your classroom involved with Monarch Watch. In addition to rearing Monarchs, Monarch Watch has several ongoing research projects that rely on student-scientist partnerships. Monarch Health is a citizen science project in which volunteers sample wild monarch butterflies to help track the spread of a protozoan parasite across North America. Our mission is to understand host -parasite interactions in monarchs and to enhance awareness of monarch biology and conservation through the coupling of citizens and scientists.